The fabrics are from the Denyse Schmidt collection now at Joann’s. The only other fabrics I added are the grey and white polka dot, the Sherbet Pips red with tiny white squares (my favorite red basic to date), and the bright blue and white polka dot. I’ve heard a lot of positive and plenty of negative about this collection…but I really love it. I don’t love every single print…but I never love ever single print in a collection. I love it! I like that it's not just two different squared squares so it doesn't appear to be a pattern to the quilt.Great scrap quilt. Fantastic – I spy the backing fabric I sent you…glad it made it to you safely! Love the pattern and the fabrics. Oh, and you are so right about Joann's we have a love/hate relationship. I am very envious of the cities that have the "super" Joann's as we still have a teeny tiny one that is loaded with fleece for some reason. They never have enough people working in the stores, especially during big sales. We have a super Joannn's that's so big!! Like take a number to have your material cut big. But I'm still not running there to get this fabric. Not really in love with any of it, and I only buy what I love. I purchased this pattern from you months ago and still haven't had time to make it :/ I'm going to use Modern Meadow, Berry. Can't wait to start it, this gives me inspiration! I love the touch of green that the collection has. It really helps give it a fresh modern twist! this quilt is really colorful and fresh ~ first thing I've seen made with this fabric. Wasn't sure I like it all that much but you've changed my mind! gorgeous colors! I love it. You're doing a good thing with those quilts. You and your hubby need to hang in there just a little bit longer! Oh I love it. The fabrics are fab!! Love this quilt. Thanks for the inspiration! Just happened to stop by…you list of "guilty" thoughts had me laughing so hard tears were in my eyes and my kids kept asking why I was laughing so hard. Probably because I have thought at least half of those myself on a regular basis…thank you for the laugh today! love!! I would love to get my hands on this fabric, I am heading to Joann's this weekend. I love that skipping squares pattern. Thanks for a better pic. 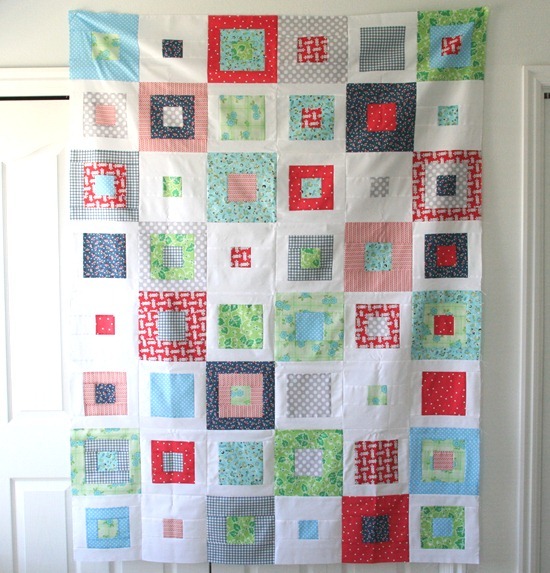 Say someone wants to learn how to quilt, I can use a machine and make many square things (cant read a pattern!!) but need to know where I should start!? A book, a video, a class?? Thanks!! 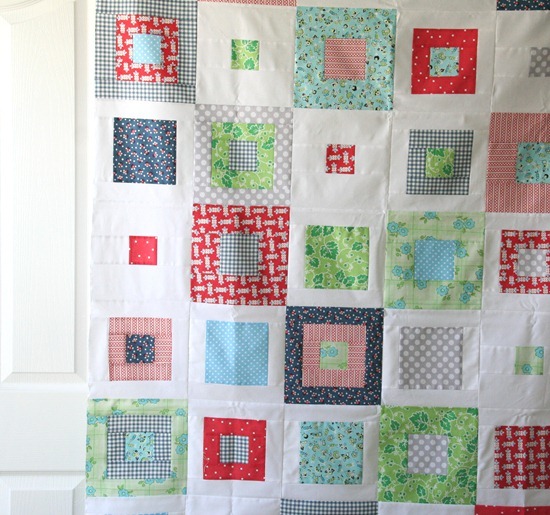 Thirteen quilt backs in one day…that's amazing!!! I'm in love with this quilt!! I love when there is so much clutter while doing patchwork, everything is full of colorful fabrics. And one combines each other, making magic with them. My husband often complains, but then I love what I do. I guess that happens to you as well. The top is very nice that you prepared. I don't always like every print in a collection either but its often those ones that make a quilt intersting. I love what you have done with the DS collection. I got some of this too and am planning on using it very soon. i love your quilt top! i'm with you. i don't love every fabric in the line, but i bought all of it anyway. i think it goes great together. did i mention that i love your quilt top??? Congrats. What a great effort on the part of you and your quilty friends. I am very impressed with your output for charity quilts, it takes us about six months to make that many. I make charity quilts weekly at my local church, but we quilt them. Obviously tying them is alot quicker … what sort of thread do you use and how many strands? Happy quilting Sue SA.